The Pectoralis major is a very powerful muscle that forms the chest prominence and. It moves the shoulder forwards and across your chest. It is best known as the muscle that you develope with the bench press exercise. 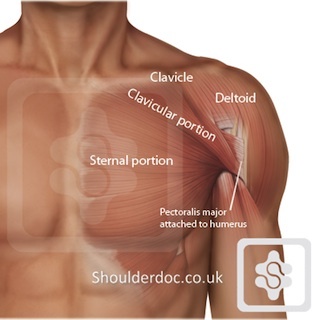 The pec major attaches to the humerus bone (upper bone of arm) and is divided into two parts. The upper part is known as the 'clavicular head' and the lower part the 'sternal head', based on their origins from the clavicle and sternal bones repsectively. 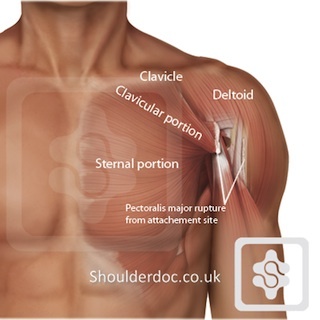 Ruptures of the pectoralis major muscle are becoming more common due to the increase in power sports weight training. It most commonly occurs during bench pressing and is felt as a painful snap at the front of the shoulder and chest. The muscle then 'bunches up' and deforms. Bruising and swelling is common. 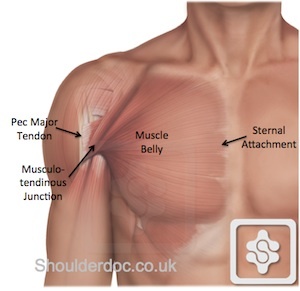 The pec major muscle is not essential for normal daily shoulder function, but is important for srenuous activities. Patients who wish to return to active athletic and manual activities are likely to benefit from surgical repair. The earlier a repair is performed the easier the surgery. Small studies have shown that the outcomes after early primary repair have generally been superior to those of delayed repair [Aarimaa et al. and Bak et al]. My own results showed no difference in outcomes between early and delayed direct repairs. [Shah et al. TSES, 2009]. However, it is important to bear in mind that this is an uncommon injury and the literature is based largely on case reports, small series, and systematic reviews of these small series. There is a lack of high-quality good evidence for surgical versus non-surgical management and early versus delayed repairs. Outcomes in the literature are also presented heterogeneously, so it is difficult to compare them. Where the tear cannot be directly repaired (i.e. massive, involving musculo-tendinous tissue or chronic) reconstruction can be considered. This is done using a tendon graft. I have found Achilles Tendon Allograft to be the strongest and most reliable tendon graft, and used this reliably since 2004. For information on tendon allografts click here. The decision on which pec major tears to repair and when depends on the type of tear, how old it is, how retracted it is, the demands and requirements of the patient and the expertise of the surgeon. - Muscle tear = extremely rare and almost impossible to repair, but can do as above and reinforce with achilles tendon allograft. - Musculo-tendinous & muscle tear - reef repair using high strength biological suture, like a hernia repair.